For decades, juice and cereal have been included as part of a “complete” and “nutritious” breakfast. Nowadays, these common breakfast items are widely criticized for their sugar content—with the truth being somewhere in between. It really depends on the amount, type, and combination of breakfast foods in your diet. 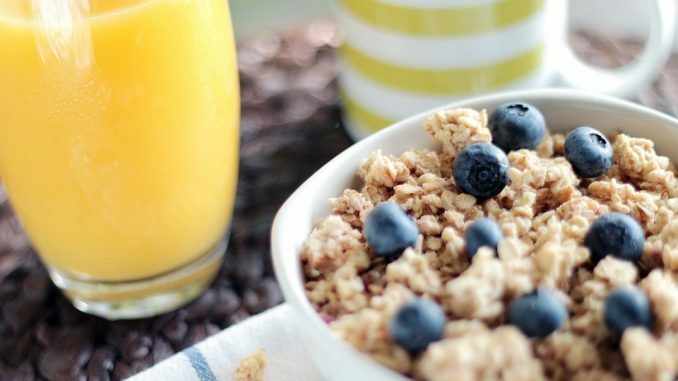 There are healthy and unhealthy ways to include juice and cereal as part of your breakfast. A healthy diet puts a fairly strict limit on sugar consumption (including artificial sweeteners). Inevitably, you must pick and choose where to satisfy your sweet tooth. Desserts can be a weak spot for a lot of people, but breakfast is different. The first meal of the day is, ironically, the best time to get your sugar when you have plenty of opportunity to use the quick energy, either at work or as part of a pre-exercise routine. Nutrient-dense juice is one of the healthiest forms of sugar available. Admittedly, we’re biased, but we think there’s a sound argument to be made that calorie-for-calorie and gram-for-gram of sugar that juice is healthier than cereal. For one thing, juices make it easy to absorb nutrients. For another thing, cereal tends to get paired with milk which can exacerbate indigestion and irritable bowel. That said, more important is the ingredients and food items you choose for each breakfast item. Whole grain and low-sugar cereals is more easily and legitimately accommodated into a healthy diet. The same is true for juices in which berries and other low-sugar fruits creates a healthier option than juices dominated by pineapple, pears, watermelon, and dried fruits that have an even higher sugar content. Pairing a healthier cereal and a healthier juice is much better overall than a single cereal or juice choice that turns into a sugar bomb. Healthier cereals are also a great way to add fiber back into your breakfast diet. Of course, if you’re looking for a high-fiber breakfast without a sugary cereal, another option is to blend your fruits and vegetables into a high-fiber breakfast smoothie. With this basic knowledge, it should be relatively easy to make breakfast choices that are both healthy and a satisfying way to start your day off right.